A beautiful example of the U.S. Coast Survey's 1866 nautical chart or maritime map of Portland Harbor, Maine. 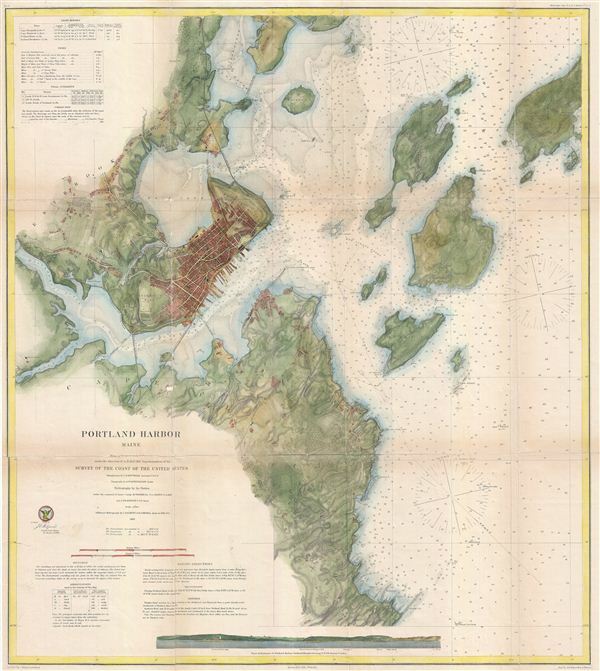 Centered on the city of Portland, this map covers from Westbrook to Long Island and from the mouth of the Presumpscot River to Trundy Point. This 1866 map represents the culmination of the Coast Survey's work in the vicinity of Portland. Unlike earlier issues, this example presents rich topographical detail as well as hydrographical data. There are countless depth soundings throughout and the left-hand quadrants feature sailing instructions, notes on tides and light houses, and a wealth of other practical information for the mariner. The city of Portland itself is beautifully illustrated with numerous individual buildings and all major streets rendered. The triangulation for this map is the work of C. O. Boutelle. The Topography was completed by A. W. Longfellow. The hydrography was accomplished by parties under the command of M. Woodhull, T. A. Craven, F. A. Roe, and J. Wilkinson. The whole was compiled under the supervision of A. D. Bache, one of the most influential American cartographers of the 19th century.